I'm a single atheist white man, 52, reputedly intelligent, with unusual interests in politics, science, music and dance. I'd like to meet a woman with varied interests, curious about the world, comfortable expressing her likes and dislikes (I hate struggling to guess), delighting in her ability to fascinate a man and in being loved tenderly, who values joy, truth, beauty and justice more than "success"--so we can share bouts of intense, passionately kind awareness of each other, alternating with tolerant warmth while we're absorbed in other aspects of life. My 22-year-old child, the Free Software Movement, occupies most of my life, leaving no room for more children, but I still have room to love a sweetheart. I spend a lot of my time traveling to give speeches, often to Europe, Asia and Latin America; it would be nice if you were free to travel with me some of the time. 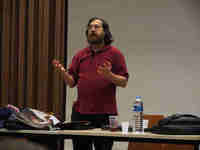 If you are interested, write to rms at stallman dot org and we'll see where it leads. 如果是我，对这样一则征婚启事一定不感兴趣，虽然我自认为是上面描述的那类女人。它只给我一个观感：He does not intend to love a woman as her wishes,but as how he likes it.That kind of love,I don't call it love.